For the second time in one week I was fortunate to spend several hours at the New-York Historical Society working in the Patricia D. Klingenstein Library. On this visit I was chiefly concerned with utilizing a digital camera to document a number of the images I had discovered on the previous Tuesday. I had enough time to take over 170 pictures, while also working my way through four books and three additional boxes of archival material before the doors closed. While most of the pictures covered images from the Bella C. Landauer collection, I was also able to snap a few from the Gosman family papers. These two collections offered me a broad spectrum of materials that presented a variety of views of Native Americans from the 1840s through the early 1940s. 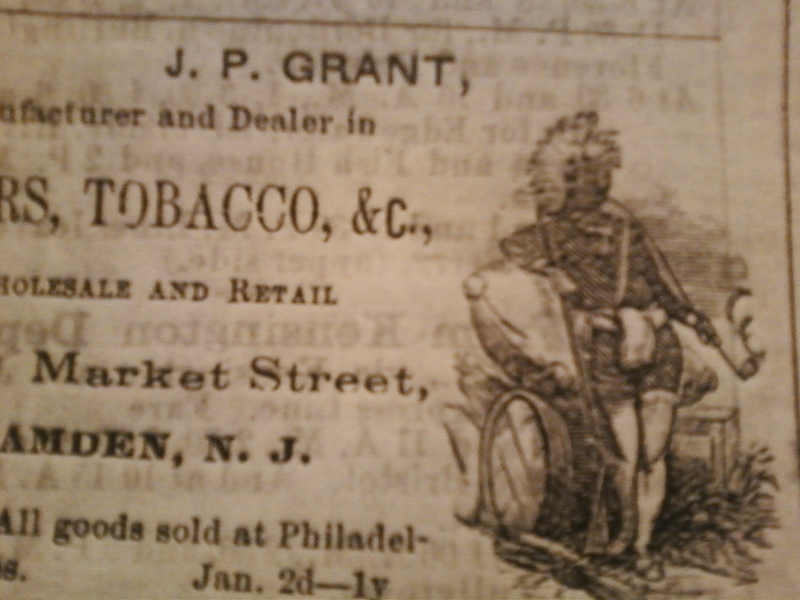 Landauer was chiefly concerned with the advertising world and as a result, the bulk of images I’ll be analyzing from her group included pamphlets and broadsides related to so-called Indian patent medicines. The Gosman collection, as I mentioned the other day, was a completely unexpected piece. The Gosman family’s papers reach back to the eighteenth century but the contributions from a teenaged Richard Gosman are thus far the only pertinent pieces. Gosman was heavily influenced by publications like Leslie’s Illustrated Weekly. Below, a comparison between an actual Leslie’s publication and a cover for Gosman should give readers a sense of what I am seeing when working with the material. Gosman clearly consumed and understood the manner in which these papers operated as well as their intended audience. Much of his written text as well as the general content for his versions of the press contain stories that mirror the style one would see in the time period in question. 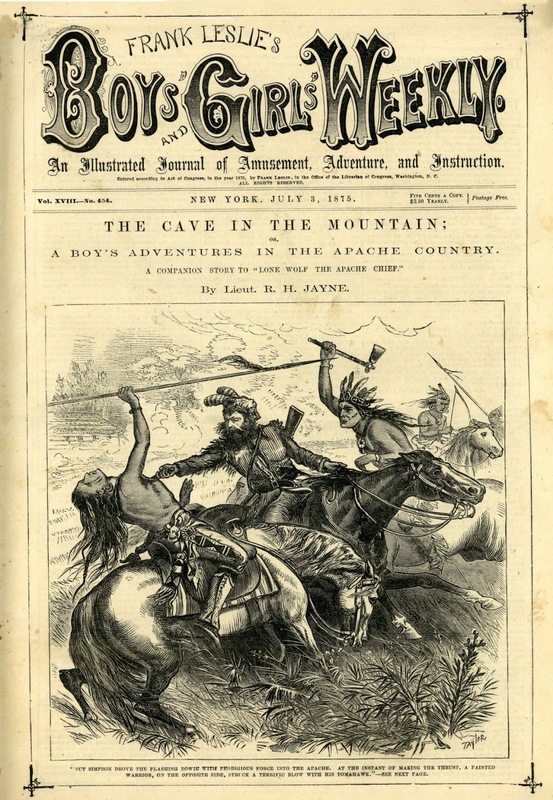 Gosman’s pieces were brought to my attention largely because of the large number of Native Americans included throughout his newspapers. Gosman’s images reflect a general nineteenth century American sensibility about what Native Americans “should” look like. Despite the fact that the young boy grew up in a state with a strong Native American presence, (the Iroquois Confederacy), Gosman only seemed to envision natives as ensconced in fringed leggings, eagle feather headdresses, and, typically, involved in conflict with white Americans. 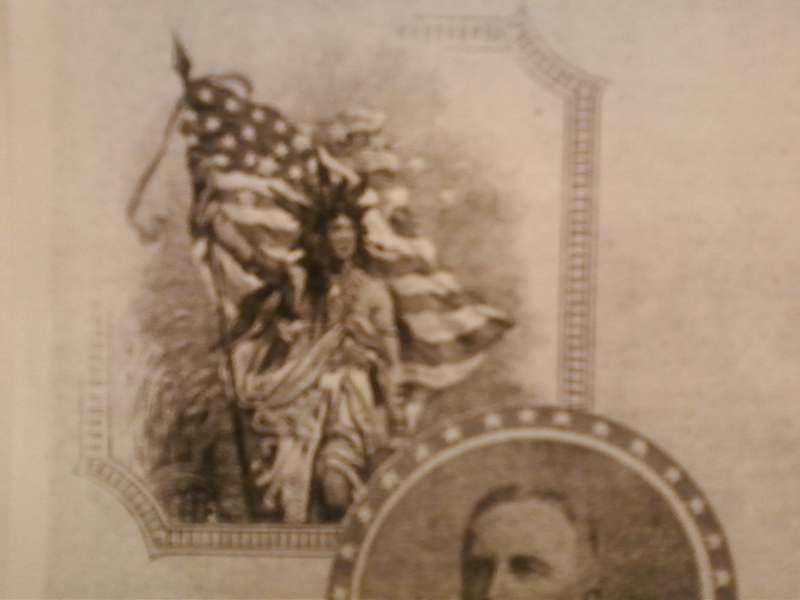 If indeed Gosman had seen Buffalo Bill’s Wild West show at Madison Square Garden (as is implied in one edition), it is no wonder that his understanding of Native Americans would prove so limited. Another comparison is apt so I’ll include another sample from a Leslie publication (one aimed at younger boys and girls) and a piece from Gosman. There is much more to be done with Gosman’s pieces and I have a number of examples to more thoroughly analyze. I’m also convinced that if similar collections to Gosman can be discovered, there will be value in pursuing a separate project that explores how children and young people co-opt elements of the adult world in creative ways. Between Gosman and the Landauer collection though, I believe I have extended the possibilities of the study. The day before I returned to the archives, I determined that a database would prove necessary in terms of keeping track of the types of images, region of origin, purported Native American tribes represented, scenes depicted, media, etc. I’m hopeful that building a catalog of the examples I find will allow myself and other researchers to more thoroughly understand the choices made by individuals in representing native people as well perhaps shed some light on why this problem continues. Although I will explore Landauer in more detail separately, a few brief words and an example of this collection is worth remark. The bulk of the collection I examined focused on medicine companies from the late nineteenth-century, many of which were located in the northeastern United States, yet that laid claim to close connections with Native American medicines and “spiritual” solutions to physical ailments. In particular, the Kickapoo Medicine Company of New Haven, CT took great liberties with the history of the Kickapoos in general, presenting an invented “sagwa” liquid as a cure all for many an ailment. 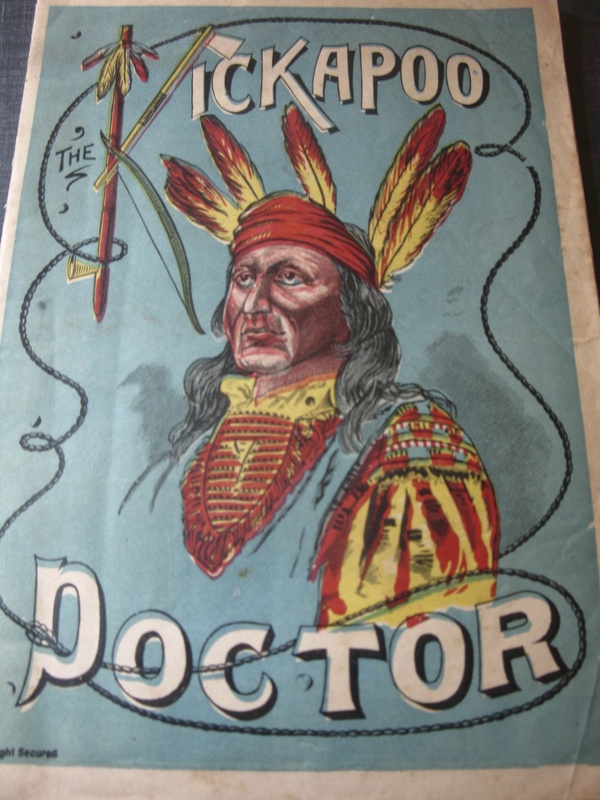 In large, lavishly illustrated pamphlets, the company presented the “history” of the Kickapoos and the arguments for why their medicines were of great benefit to the general public. A cursory level of research on my part reveals zero connection between the founders of this company and the Kickapoos themselves. Like Gosman, the founders of the company chose to illustrate native life on their own terms. While I’m not surprised by my initial findings, I am curious to see where the pursuit of additional ephemera takes me. Eugene Yelchin, Breaking Stalin’s Nose. New York: Henry Holt and Company, 2011. A friend suggested this text, especially in light of my reading Bloodlands, and it was, in a word, perfect. Yelchin’s protagonist is ten-year old Sasha Zaichik, a young boy living in the Soviet Union in what may be the post-World War Two era. Written and illustrated by Yelchin, the book is dedicated to the author/illustrator’s father who “survived the Great Terror.” Readers of my review of Tim Snyder’s book will understand what such survival is a remarkable feat. Sasha has a problem however and Yelchin brilliantly unveils the complex and uncertain nature of life in the Soviet Union. Sasha’s father is an important officer in the State Security, yet that doesn’t protect him from arrest. The fate of Sasha’s mother is revealed as the story evolves as well, and in general, what we see is an increasingly cynical world system that depends upon blind obedience, even in the face of personal uncertainty. This fall, I am embarking on the first sabbatical of my academic career. I began teaching twenty years ago in January 1994 as an adjunct at Northeastern University; other than a brief break when I was a non-teaching assistant in graduate school, I have been working. Part of my sabbatical plan for this fall is to engage with historical research and writing in a more regular manner than I have since about 2009. I have been fortunate in engaging with teaching a subject I truly enjoy – the methodology of teaching history – but that coursework, and advising future secondary school history/social studies teachers, has occupied the majority of my time over the past five years. My application was relatively simple: “I am requesting a sabbatical in Fall 2014 in order to complete research and begin analysis of the ways in which visual culture represent Native Americans in the nineteenth century.” In addition I pointed out that this particular project stemmed from some rudimentary work I did in relation to the National Endowment for the Humanities program in summer 2012 (see blog posts from July 2012). I have had the great fortune of finding a campus-sponsored writing group this semester as well. A group of fellow faculty and myself are all working through Wendy Belcher’s text on writing articles for publication. I have set the goals of editing a paper I presented in January 2014 on missionaries in Nebraska in the early nineteenth century as well as completing a book proposal based on my research into frontier community development in Nebraska. In addition, I hope to get a draft worked through of this research on how Native Americans are represented in visual culture. 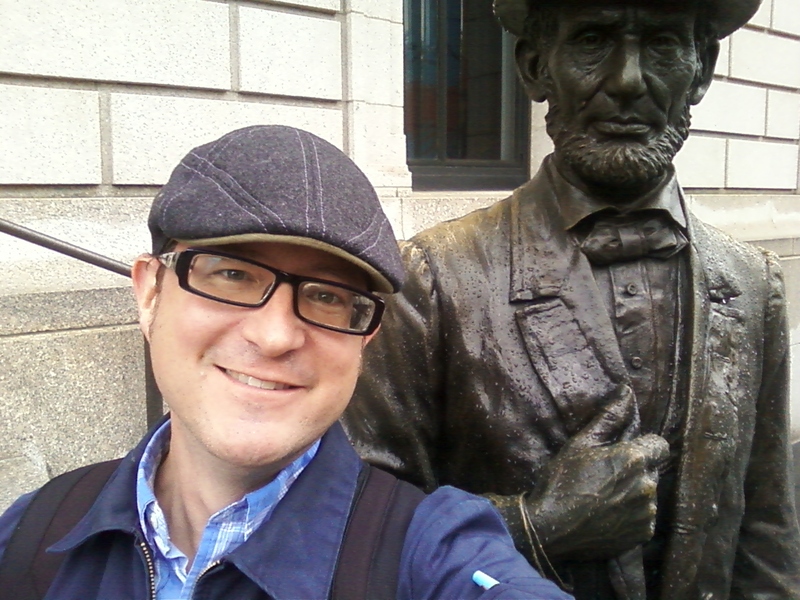 This past Tuesday I re-visited the NY-Historical Society and was delighted to discover a number of sources that will aid me in research and perhaps even inspire a few additional avenues of writing. The bulk of today’s post is focused on writing up what I found on Tuesday, with a few thoughts on the steps I might take from here. Several pieces from the manuscript side struck me as useful for courses I teach such as Native American History or the United States history surveys. 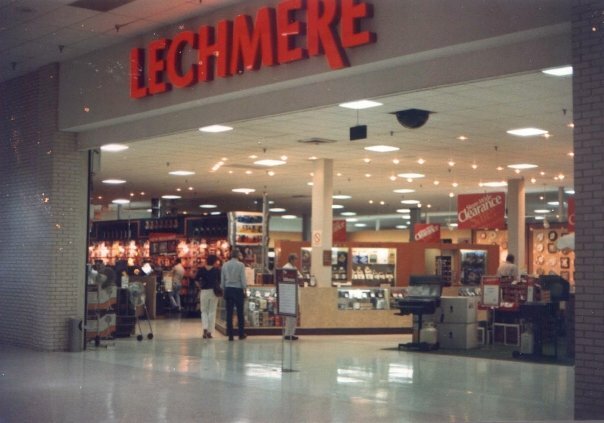 I quickly made notes on a few items referenced below that would likely require return visits and perhaps photographs. In some instances, I wrote down quotes that I believe might prove useful as exercises with students in future classes – perhaps providing the students with the quote and some historical context and then working through quick analysis schemes. Years ago I completed a long bit of research on factionalism in the Cherokee Nation from the 1830s through the Civil War period. I had originally intended to return to this field for my Ph.D. research and then I wrote on other topics but I am always interested in finding new materials – in this case I was able to hold in my hand an original letter written by Principal Chief John Ross! I was curious about these comptroller records that seemed to indicate how land sales were conducted in lieu of the residents (natives) paying some form of tax. It’s not a project in which I’m engaged, but it interested me from the perspective of providing some different types of documents for students to work with in class. The second item had a number of “animal totems” for signatures to represent assent on a treaty agreement by Delawares. The particular images fell outside the purview of my study in both chronology and type (I’m trying to discern why people outside native culture choose to portray natives in a certain way) but I found the animals intriguing and discovered them on another document. My first find in the manuscripts side of the NY-Historical Society came only five folders into the process and immediately at the front of said folder. It was the type of image I was not surprised to find, being an ad for tobacco products and featuring an image that uses regalia as well as a pose reminiscent of late 16th and early 17th century European perceptions of native people. The translations of certain dialects I found fascinating as well and certainly the material from folder 6 I plan on revisiting for a separate project related to missionaries among native people. The alleged portrait of Black Hawk was one of the few items I expected to find in this collection and for awhile I thought it might have gone missing from the box. The sketch is purported to be the work of Dr. Samuel DeCamp, a military surgeon who served in the U.S. Army from at least the 1830s through his retirement in 1862. 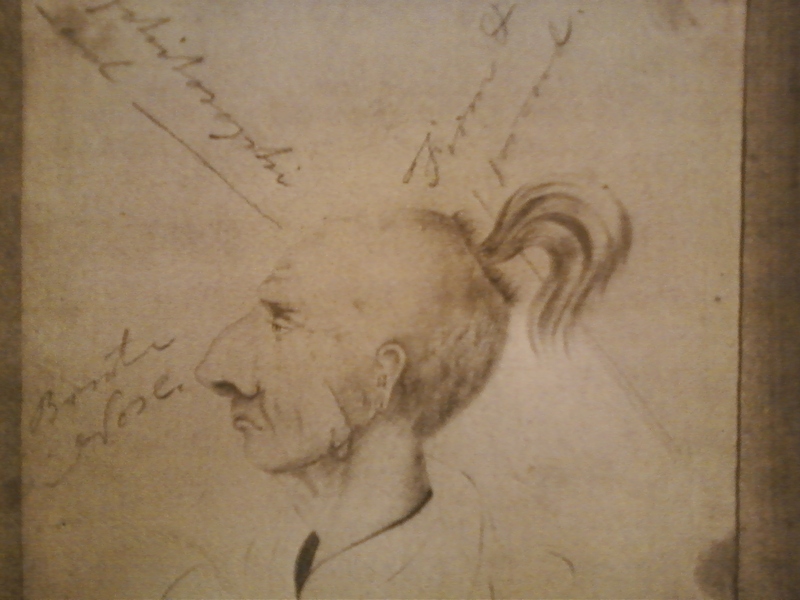 The portrait is different from others of Black Hawk (a Sauk chief) I have seen, including a famous George Catlin piece. The side profile is one such notable issue as is the pronounced nose – whether the work is therefore that of an untrained artist and any less “accurate” a portrayal I can’t say. I’m curious to dig into this piece more and DeCamp’s background to see whether the claim in the file can be supported. The following collection was a great example of the kind of unexpected stuff that happens when you walk into an archive. As soon as I explained my project to Tammy K. she immediately suggested I look at the Gosman papers. It’s the kind of collection I never would have stumbled on with my own efforts, yet because she was paying attention at some point to these documents, they came to my attention. 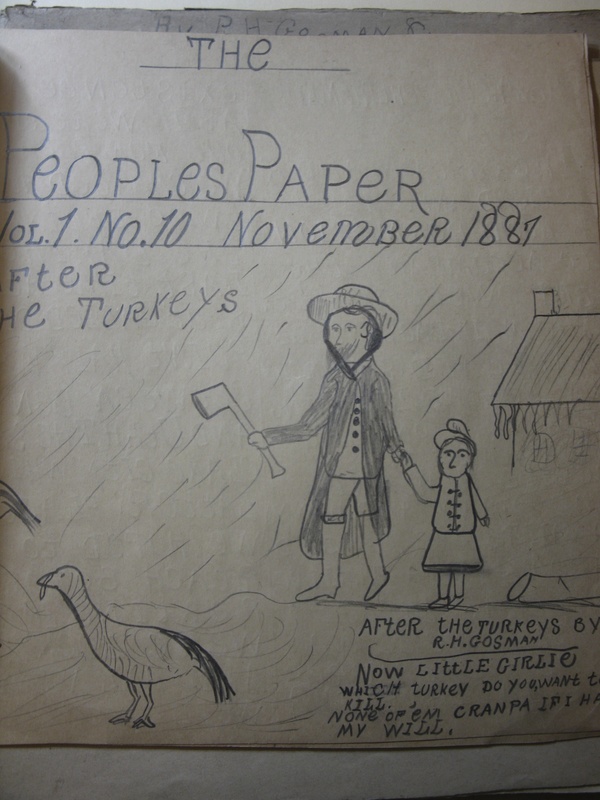 Young Richard Gosman was between the ages of 11 and 13 when he produced what, in Tammy’s words, were in effect ‘zines of the nineteenth century. He wrote articles, created the names of the papers, illustrated them, and drew up his own ads for each as well as kept track of volume numbers, etc. If you peruse my rough notes below, you can see some of the cool observations one can make out of this type of primary source. As my artist/actor friend Tony W. pointed out – something must be done about these papers! What’s fascinating to me is the level of work and creativity Gosman placed into his creations – the recipes are likely from his own family kitchen in Long Island City, the most common add is for eggs from the RHG company (him), and there are great stories about seeing a variety of shows at Madison Square Garden. The images Gosman creates of natives are exclusively those representing native people from the Great Plains, and, arguably, are largely Lakotas. 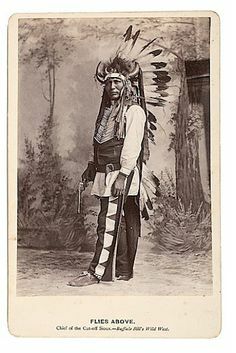 The young boys and older men are almost exclusively in fringed leggings and shirts and on horseback, often adorned with complex feather headdresses. 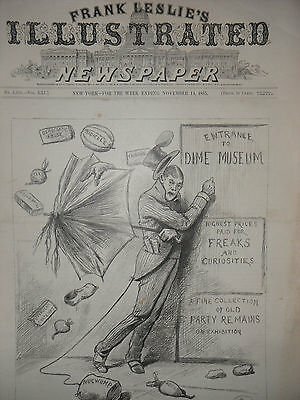 As some of Gosman’s drawings appear to be real people, one has to wonder whether he saw their images in programs from Wild West shows or in actual newspapers, etc. Regardless, this particular collection opens up a lot of possibilities – there is ample material with which to work on the question of visually interpreting native people, but there is also much to consider in terms of the entire project. Are there other such examples? I feel as though there are multiple directions for this particular resource. 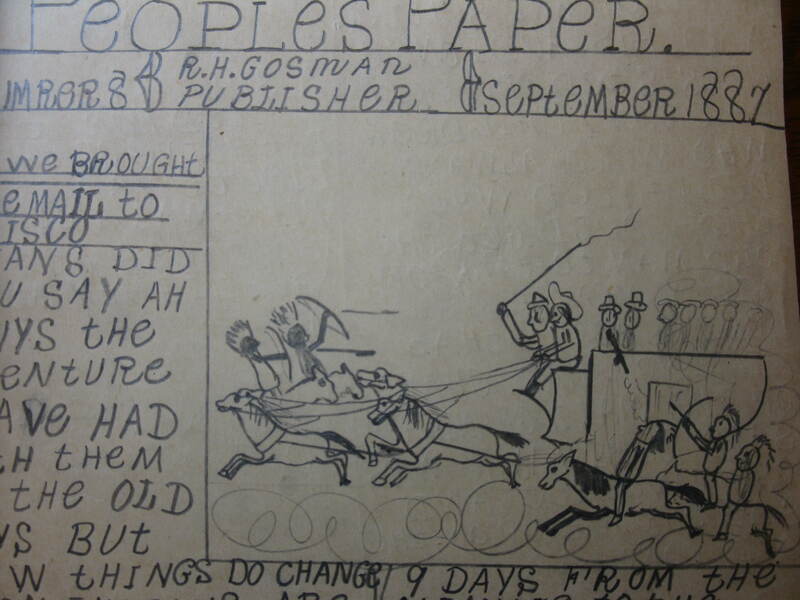 Gosman has created these interesting newspaper/club journals that reflect some interests of his (stories, fables, graphic representation) and he also populates his journals with ads, often for an egg producer who bears his own initials! Much of the Patriotic Envelope collection has been digitized and you can see some of that collection via a Library of Congress digital exhibit that the NY-Historical Society put together with funding from the Andrew Mellon Foundation. Sailor next to native dressed in red blanket leggings, moccasins, holding hatchet, gold arm band, feathers in headband, background has natives in dugout canoes but they are spearing a deer???? Nothing really in here though there are a few firsts that could be interesting to some people with Olympics envelopes and a series from the White House that lists presidential dates? As in manuscripts, I was aided in the print collection by some folks who, once they heard what I was looking for, made some suggestions. The Bella Landauer collection was something I had a vague recollection of from my visit in 2012, but I hadn’t read the finding aid online as yet. This collection clearly exhibits characteristics of a needed deep read because in two folders alone from one box I found quite a few examples that will prove useful. All in all, it was a profitable visit and one I am likely to soon repeat so I can take more time with the collection. Along with looking at these objects directly, I’ve been reading a variety of secondary sources to help contextualize the images I’m looking at in this archive and others I hope to visit this fall. 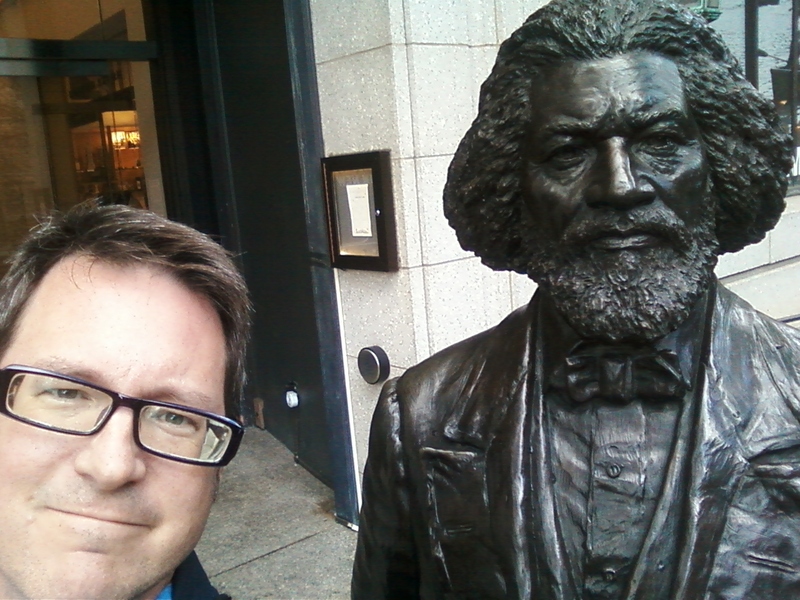 Meantime, you can find me on occasion near 79th and Central Park West, hanging with Frederick Douglass or perhaps Abe Lincoln. Philip Kerr, Prayer. G.P. Putnam’s Sons, 2014. I have written on Kerr in the past, chiefly focused on his Bernie Gunther character, though I’ve read a few of his other works as well. Prayer is unlike any other text I’ve read of his writings, and I’m uncertain still as to whether this is a good thing or not. As I worked my way through the novel, I commented to a friend that I found the book creepy and more than a little frightening at times. In the end, I lean more on the idea that the story is a bit messy, the main character thoroughly unlikeable, and some of the resolutions left me wondering – is it over? Was it real? What was real? 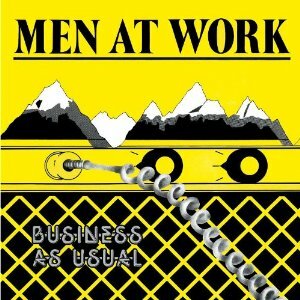 FBI agent Gil Martins is a Scottish immigrant who spent formative teenaged years in Boston, MA, worked as a lawyer, and quit in the post 9-11 malaise to become an agent for the Federal Bureau. He’s on the backside of a failing marriage, drinks too much, and has lost his faith in God, if not also humanity. 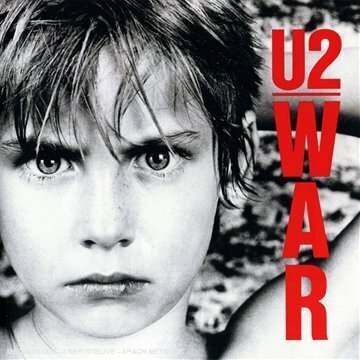 When the story opens up, we learn that Martins, raised Catholic in divided Glasgow, has converted to evangelical Christian but is really more of a burgeoning, if not fully committed, atheist. The personal religious struggles of Martins are somewhat interesting, but as other reviewers have noted, Kerr has not created the most sympathetic protagonist. Martins, as written, simply cannot pull off the sardonic, self-aware witticisms that come so easily to Kerr’s Bernie Gunther. Perhaps this is unfair – making comparisons between the creations of an author, but arguably it is also the fate of a writer who largely works in the serial of the Gunther cosmology (or at least as done so for roughly ten years). Despite what I perceive as a misstep in character design, there are elements of the story that certainly worked to keep me intrigued. Ultimately however, I ended up disappointed in the novel. I am still unclear, five days or so removed from finishing, exactly how the string of murders that were under investigation by Martins are resolved, or perhaps they aren’t? I wrote earlier that the book was both creepy and frightening. I will stand by that judgement and it is in this particular element that I see success in Kerr’s writing. He effectively creates an unsure, unsafe, and bizarre environment with a touch of the paranormal. My personal problem was, I did not care what happened to Martins, I was not certain I cared about the main antagonists, and I found the seeming abandonment of some characters, like Martins’ FBI partner, odd. Does Martins, and Kerr by proxy, ask some interesting questions about the nature of God and prayer in general? Perhaps, but I still found that in spots, the story was “flabby.” Prayer is worth investigating, but if you leave off halfway through the novena? I won’t judge.